Let’s get one thing straight: Shanghai 2019 was not the 1000th World Championship Grand Prix. It was the 1000th World Championship race - and the distinction is crucial because 11 rounds of the F1 Championship - from 1950 to 1960 inclusive - also featured the Indianapolis 500 as a point-scoring round. And the F1 world took Indy seriously. 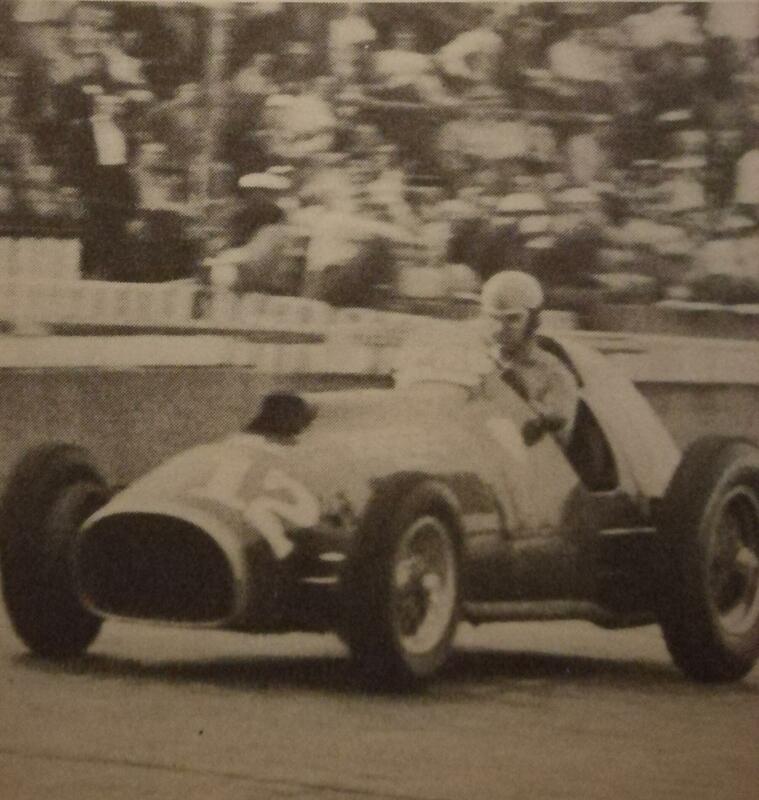 Giuseppe Farina had three decent looks at the Brickyard; Juan Manuel Fangio practised for the 1958 race; and Alberto Ascari raced an F1 Ferrari there in 1952, the year he won his first F1 World Championship. 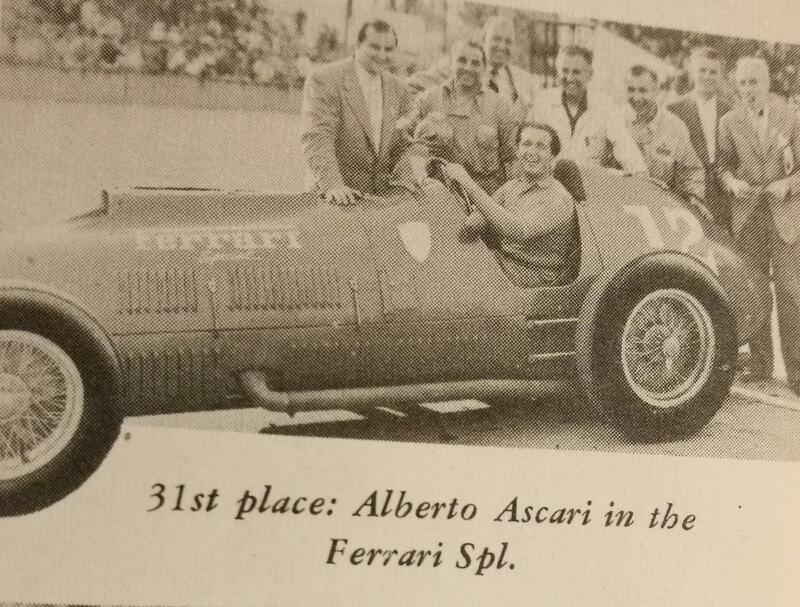 Ascari would of course be the driver of the 1952-53 F1 seasons, winning races for Ferrari in all conditions; but Indy was a challenge he specially relished and for which he was prepared to make huge sacrifices. The month of May clashed with the 1952, May 18 Swiss Grand Prix at Berne - the opening round of the new F2-based F1 championship - but Ascari’s commitment to the Brickyard was absolute. Even as Ferrari were finishing one-two-three in Switzerland, over at Indy Ascari was wowing the huge US crowds with his 1951 F1-spec, 400bhp, 4.4 litre, 12-cylinder “Ferrari Special”, officially entered by “Enzo Ferrari”. Enzo Ferrari was of course a businessman as well as a racer, so he financed Ascari’s Indy attempt by selling three additional cars to Johnnie Parsons (who was hoping to earn a drive to Europe if things went well), to Johnny Mauro and to the fuel injection wizard, Howard Keck, who fielded the big Ferrari as a back-up car for his regular driver, the phenomenal Bill Vukovich. 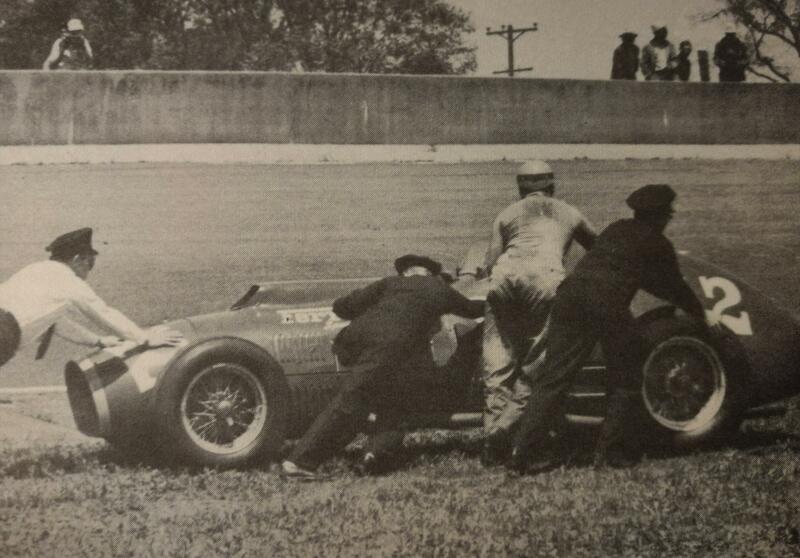 None of the private Ferraris were quick, however - and Parsons, a fast oval driver, reluctantly switched to a conventional Indy roadster for the race. Enzo’s reaction was not recorded but we can guess it made no difference to him since the money was by then in the bank. Ascari, though, stuck with it, despite the F1 Ferrari 375’s obvious unsuitability to the Speedway, its relatively low top speed and the steady rain that limited his track testing prior to qualifying. Just in time for the q-weekend, Aurelio Lampredi, Ferrari’s Chief Engineer, flew the 27 hours from Milan to Indy in a McDonnell-Douglas DC6 to work on the V12’s torque and carburettor balance. “Car and driver convinced sceptics beyond all doubt in qualifying,” gushed the US media. “Ascari will be one of the toughest to deal with in the race. He poses the greatest foreign threat in nearly 40 years…” (since Italy’s Dario Resta won in 1916, to be precise). Alas. Ascari ran in the top ten over the first 100 miles but spun into retirement when one of the Ferrari’s spoked wire wheels (!) suddenly broke. “I did mention to Ing Lampredi that the wire wheels might be a problem,” wrote the German journalist, Gunther Molter, later, “but I think the message was lost in translation….” Ascari was classified 31st and won a total of $1983.19 for the Commendatore - about $20,000 in today’s money. Troy Ruttman won the race that year - and I’ve long been a Ruttman fan not only because he was young then (22) and obviously brilliant on ovals and dirt roads but also because he would eventually find his way to Europe - to Reims, to be precise, where he would race a Maserati 250F in the 1958 French GP. The Maser was out-dated by then but Troy, as Dan Gurney once said, was an American who could have been ultra-successful in F1 had he been given a serious chance. As it was, Ruttman spent every dime he had on that French GP venture with no tangible return. Such was his commitment. 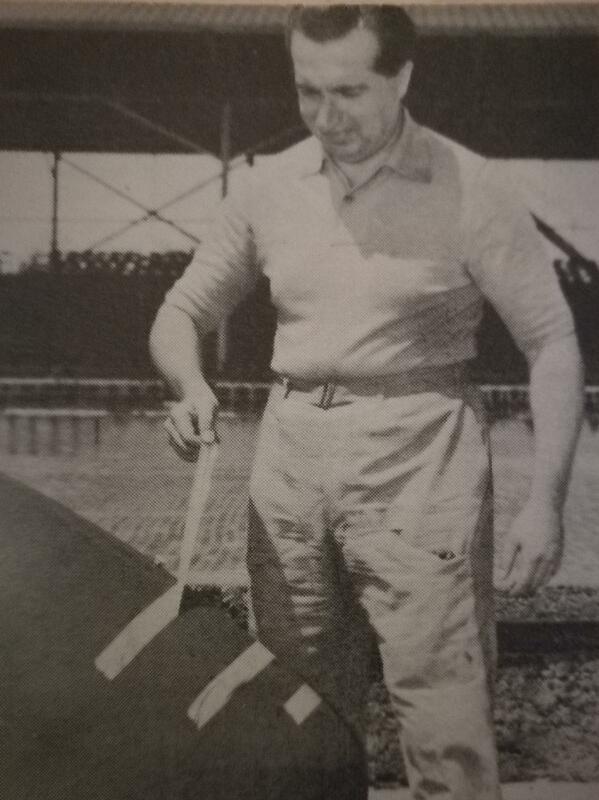 So Indy was very much in the minds of the 1950s European F1 crowd. The irony is that by the time the Europeans cracked the Brickyard - in the mid-1960s - Indy was no longer an F1 points-scoring race. In 1965 Jim Clark missed the Monaco GP in order to give Indy his full attention - and he won both the 500 and the F1 World Championship that year. I’m pretty sure you won’t see that achievement repeated this side of 2525 but when I once described Clark’s feat to the former American F1 driver, Scott Speed, his response was, surprisingly: “Why would Clark do that?”. I guess it’s a generational thing. A better question is why Indy was included in the World Championship for that decade. The answer is because Ford in the 1950s were building and selling more cars than all the European manufacturers combined and because the FIA were trying to create a World Championship that embraced the USA. Thus the Indy 500 played its part in F1’s growth: indeed, it was only when the Sebring road course staged the first USGP in 1959 that it was time to bring the Indy 500 oval F1 era to a close. For the record, Johnnie Parsons, Bill Vukovich, Jim Rathmann, Jimmy Bryan and Rodger Ward were the major F1 point-scorers from that Indy 500 era, with Ward actually doing an Ascari in reverse by racing his Kurtis roadster in the 1959 USGP. Take away those Indy 500s from the F1 Championship and what will be the 1000th Grand Prix? You guessed it: Monza, 2019. Now there’s a venue for a party. And it was at Monza, remember, that they staged the Race of Two Worlds - the reverse-oval events that featured all the major Indy drivers (and their cars) against F1 stars and their (slightly-modified) F1 and sports cars. Staged in both 1957 and 1958, “Monzanapolis” was staggeringly dangerous and fast, as Ferrari’s white-knuckle star, Luigi Musso, demonstrated to a breathless F1 world, but it’s a reminder of the bond that used to exist between those across the Atlantic and the F1 players in Europe. So let’s make it huge: let’s celebrate the 1000th Grand Prix at Monza this year - and, just for old time’s sake, let’s invite some of the leading IndyCar drivers (and their cars) to Monza for some demo laps and donuts. On Sunday. In front of packed grandstands. Hamilton and Leclerc in Penske Dallaras. Dixon and Hinchcliffe in a Merc and a Ferrari. And Fernando Alonso, of course, in both Indy Dallara and F1 McLaren….